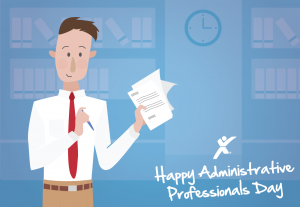 Administrative Professionals Day honors the skills needed to truly excel in the position. Businesses couldn’t exist without administrative professionals. These are the men and women who run the ship. They do so much more than schedule meetings and answer phone calls. They are often the first person to greet clients or prospects and given that they spend so much time interacting with the public, they need to know everything about the company, from history and departments to statistics, personnel, and more. That’s true dedication. So what makes for a truly skilled administrative professional? Above all else, an administrative professional needs to be able to communicate. As the first point of contact for the office or department, they act as the gatekeeper. A talented administrative professional has an open personality reflective of the company’s own culture and values. He or she communicates with a wide variety of individuals of varying backgrounds, from unsatisfied customers to CEOs. An administrative professional also knows how to communicate across numerous channels, from telephone to in-person to email. Administrative professionals must communicate with the executive suite daily to achieve the goals of their department. This can be quite difficult, given the busy schedules of executives, so patience is a must. Administrative professionals must be kings and queens of managing personalities and working through (and sometimes around) problems. They are able to manage not only their own schedules, but also those of pretty much everyone else. As gatekeepers, they keep track of everyone who enters or leaves the department or office. They meticulously sort through and organize electronic documents and emails. Disorganization is not acceptable on any level. Multitasking skills are a necessity — no two days are ever the same. All of this work requires an incredibly organized mind, given that an administrative professional may be called upon to locate a person or document at a moment’s notice. Administrative professionals are expected to dress in line with the company’s public image. But professionalism is about more than just dress. It’s also about conduct. They are frequently the first point of contact for vendors and customers. As such, any time spent staring at a phone or surfing the web reflects poorly on the business as a whole. In today’s world, technology skills are essential for strong administrative professionals. At the very least, they should be proficient in the main Microsoft Office Suite programs (Word, Outlook, Excel, and PowerPoint). The more they know about other programs, such as social media (Facebook, LinkedIn, Twitter), the better. Looking for Your Next Administrative Opportunity? We’re here to help. Headquartered in Oklahoma City, OK, Express Employment Professionals is a leading staffing provider in the U.S. and Canada. We employed a record 510,000 people in 2016. If you have any questions about the job search, contact your local Express office or create an Express account to apply for jobs online. Looking to become an administrative professional? Let us know your thoughts in the comments below!